Will UK house prices crash in 2019? Over the last few months, the average UK property price started to fall according to the major house price indices. So is this the beginning of a more serious decline, or a temporary blip? The last year was a tumultuous one for the UK economy, with the pound tumbling, the base rate rising and Brexit looming on the horizon. With that same uncertainty following us into 2019, it’s no wonder homeowners are anxiously watching their property values, while buyers are looking for the right moment to strike. Which? explains what’s happened to house prices in recent times, what you can expect in 2019 and how it will affect home owners and aspiring buyers. Looking to buy a home or remortgage in 2019? For expert advice on your mortgage options, call Which? Mortgage Advisers on 0800 197 8461. What could last year’s house price trends mean for 2019? There’s no crystal ball that can predict how house prices will move, but it can help to consider whether recent trends are likely to continue. Which? looked at four major house price indices in the UK market: the ONS index, which is based on sold prices; the Rightmove index, based on asking prices; and the Nationwide and Halifax indices, which are both based on mortgage lending (you can find out more below). While the indices show different average house prices throughout 2018, all show a dip towards the end of the year, indicating that average house prices are falling. The average price in August, according to the ONS, was £232,917 – by October, it was £231,915. That said, month-on-month fluctuations are to be expected, as property tends to be more in demand at some times of the year than others. Another way to look at the data is by examining the year-on-year change. This shows that prices are still higher than a year ago by most measures – except for the Rightmove index – but that growth has slowed over the year. Which house price index is the most accurate? It’s clear that house price indices don’t always align, but that’s not to say that any of them are wrong. Each draws upon a different data set, meaning you’re seeing a snapshot of the market at different times. The ONS bases its data on all sales recorded in the Land Registry, which makes it the most comprehensive source. But there’s a two-month delay in this data being published, not to mention a significant lag between a house being sold and the registry being updated. That means this index may not provide the most current information. Both the Nationwide and Halifax indices are based on the lenders’ residential mortgage data. The data is published at a one-month delay – so, for example, information on mortgages approved in November is released in December. The Rightmove house price index, meanwhile, is based on asking prices by owners on the property portal. As most owners will ask for the highest possible price, the index is inflated and does not usually reflect what houses are actually selling for. However, the data is accurate for the month it’s published, meaning you can use it to take the temperature of what owners and agents currently expect. Find out more: how much is your house worth? Looking at the trends over the past few months, a number of experts believe house prices may grow more slowly over the coming year. 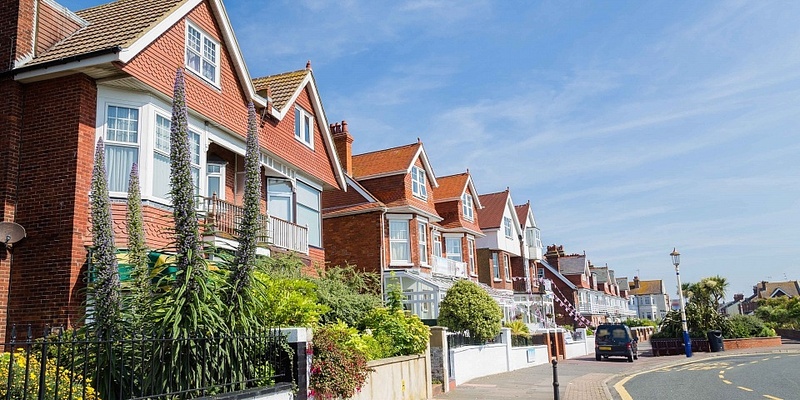 Property surveyors’ association Rics warns that house prices are unlikely to move at all in 2019, while property consultancy JLL puts growth at just 0.5% for the coming year. Estate agents and banks are a little more optimistic, with Savills predicting modest growth of 1.5% and Halifax estimating prices could rise anywhere between 2% and 4%. However, there are a number of hard-to-predict factors that could influence price growth over the coming year. The UK is set to leave the European Union in March 2019, but the consequences of that for the economy, trade and employment are still unclear. If Brexit leads to a drop in economic activity or loss of jobs, it’s possible that house prices may suffer too. On the other hand, a stronger economic outlook could put more money in people’s pockets and give house prices a boost. This means Brexit negotiations are one of the key factors to watch over the coming year. The Bank of England base rate influences how much lenders charge consumers for borrowing. A higher base rate may push up mortgage rates, making it harder for people to afford repayments and slowing price growth. The base rate fell dramatically after the financial crisis of 2008, but in the past 14 months it’s been on the rise – first to 0.5% in November 2017, then up to 0.75% in August 2018. At its most recent meeting, the Monetary Policy Committee suggested more hikes could be necessary, albeit at a ‘gradual and limited extent’. Economic factors tend to influence demand for property: when people are better off, they can buy more homes and pay more for them. But it’s also worth considering the supply of properties, which is relatively tight in many areas of the UK. Halifax predicts that growth will remain comparatively strong over the coming year, despite challenging conditions, due to the ‘shortage of homes for sale and low levels of housebuilding’. If fewer homes are available, sellers can demand more for the homes that are on the market. Government regulation can have a significant impact on property prices, especially through schemes that incentivise people to buy. The Help to Buy equity loan, for example, enables buyers to borrow a certain percentage of the cost of a new-build home from the government. Across England and Wales, it’s 20% (except in London, where it’s 40%); in Scotland, it’s 15%. Critics have argued that this has led to the artificial inflation of new-build property prices, which some have dubbed the ‘Help to Buy premium’. The Scottish government has also announced an increase to the LBTT (Scottish stamp duty) surcharge for buy-to-let investors, due to take effect on 25 January 2019. The change could lead to a spike in sales over the next few weeks as investors rush to complete before the increase is implemented, before dampening demand for buy-to-let properties. While keeping an eye on broad market trends is important, they won’t necessarily tell you how much your own home (or dream property) is worth. To value a specific property, you’ll need to look at sales nearby and how the house compares based on its size, condition and location. If you’re concerned your home’s value might have dropped, you could ask local estate agents to give you a valuation and research what similar homes in the area have sold for. To find out more, you can read our guide: how much is your house worth? If you’re hoping to remortgage, keep in mind that lenders and surveyors will tend to be more conservative in their valuations than estate agents, so you might find that you can’t remortgage at the loan-to-value ratio you might expect. In the worst case, you may not be able to remortgage at all, and end up paying the lender’s standard variable rate. Find out more in our guide to remortgaging. Similarly, when you’re buying in a market that’s volatile, beware of offering more than the bank is willing to lend. Down valuations – when a lender values a property for less than the buyer has offered – are more common in markets where prices are falling, but owners’ expectations remain high. If this happens to you, you’ll need to see whether the seller is willing to accept a lower price than you originally agreed. Then again, buying in a slow market could be an opportunity to bag a bargain that you may not have been able to afford previously. You can use our tool to compare the best places to live in England. In uncertain economic times, finding the right mortgage deal is critical – both when buying and when remortgaging. It can help to speak to a mortgage broker, who can help you find a deal that suits your circumstances. To speak to an expert today, call Which? Mortgage Advisers on 0800 197 8461 or fill in the form below for a free callback.